Highly visible premium kit for fast moving larger spills. Contains a variety of EnvirosorbTM premium polypropylene oil & fuel only absorbents and organic Global Peat ground and floor absorbent. EnvirosorbTM is able to recover up to 20 times its own weight in oil and is highly water repellent (hydrophobic). 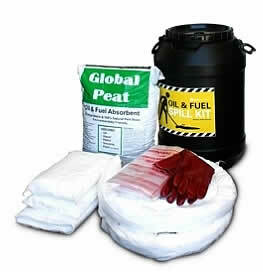 Global Peat is highly oil absorbent (approximately 5 times its own weight in oil), light weight and easy to use. A Global Audit Tag is included and when fitted, will readily identify when the kit has been accessed or used. Spill Kit includes label, laminated re-order form & operating instructions contained in a specially designed document holder fitted to the back inside wall of the wheelie bin. UV stabilised and colour coded labels are fitted to the front and sides of the wheelie bin. The front label identifies the type of kit and product absorbed, whilst the two side labels provide clear and concise Emergency response instructions. Spill Kit can be converted to a "Pollution Control Station" with accessories such as shovels (long handled or non sparking), wall mounted signs, bassine brooms, bin covers, squeegees, bin locks or rakes. Spill Kit is supplied in a 240 litre wheelie bin with a choice of colours available to suit individual requirements. 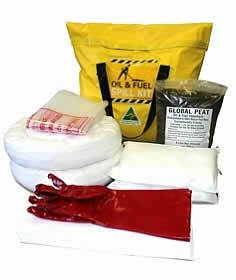 Spill Kit type: Oil, fuel, diesel, petrol, solvents & other petroleum products. Application: Unsealed areas around mine sites, drilling rigs & truck stops. Components designed for harsh conditions. Highly visible premium kit for smaller workshops and outdoor locations. Spill Kit can be customised by adding/removing/swapping components. Spill Kit can be converted to a "Pollution Control Station" with accessories such as shovels (long handled or non sparking), wall mounted signs, bassine brooms, bin covers, squeegees, bin locks or rakes. 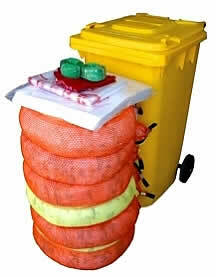 Spill Kit is supplied in a 120 litre wheelie bin with a choice of colours available to suit individual requirements. Application: Unsealed areas around mine sites, drilling rigs & truck stops. Components designed for harsh conditions. Great all-round slim spill kit designed to fit tight spaces in a vehicle cab. Spill Kit includes labeled bag, laminated re-order form & operating instructions. UV stabilised and colour coded labels are fitted to the front of the bag kit. Spill Kit is supplied in a highly visible 'safety yellow' water resistant carry bag. Velcro closure allows easy opening and closing with handles included for carrying or hanging on a wall. Application: Outdoor areas around mine sites, drilling rigs & truck stops. Components designed for harsh conditions. Designed for those who carry small amounts of liquid but still need a spill kit. 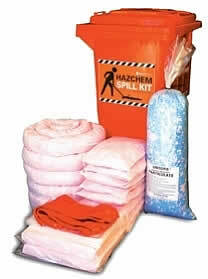 Spill Kit includes labelled bag, laminated re-order form & operating instructions. Velcro closure allows easy opening. Application: To contain and clean up spills on harbours, ponds and other inland water ways. Contains 16.2 effective metres of Envirosorb™ polypropylene oil & fuel only absorbent snap hook booms. Spill Kit includes 50 absorbent pads to help in the cleanup operation. Spill Kit also includes rope, knife, gloves and disposal bags. The kit comes with a lid cover to prevent the ingress of water and rubbish. Envirosorb™ is able to recover up to 20 times its own weight in oil and is highly water repellent (hydrophobic). Spill Kit includes label, laminated re-order form & operating instructions. Barrel container is ideal if the spill kit will be located in the elements. Spill Kit includes labelled barrel, laminated re-order form & operating instructions. Spill Kit is supplied in a tough black water proof barrel with a screw lid. Application: Laboratories, workshops, warehouses, loading docks, manufacturing stores, for spills on a sealed surfaces. Small and compact kit housed in a tough white pail. Contains a variety of EnvirosorbTM premium polypropylene oil & fuel only absorbents. EnvirosorbTM is able to recover up to 20 times its own weight in oil and is highly water repellent (hydrophobic). Clean non-allergenic, non-hazardous absorbents, with little or no dust. UV stabilised and colour coded labels are fitted to the front of the drum. 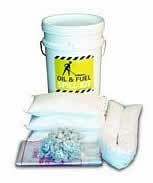 Spill Kit is supplied in a 20 litre white pail with snap-on lid. Spill Kit type: Acids, bases, coolants, solvents, oils & HAZMAT chemicals. Application: Workshops, warehouses, factories, chemical plants, laboratories - wherever hazardous chemicals are stored, handled & spilt. Contains a variety of UnisorbTM premium polypropylene HAZMAT chemical absorbents. UnisorbTM is able to recover up to 20 times its own weight in liquid. 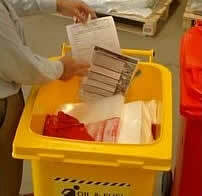 Application: Workshops, warehouses, factories, chemical plants - wherever hazardous chemicals are stored, handled & spilt. Respond to smaller spills quickly with this specially designed kit. Spill Kit is supplied in a 120 litre wheelie bin with a choice of colours available to suit individual requirements. Application: Small workshops, warehouses, factories, chemical plants - wherever hazardous chemicals are stored, handled & spilt. Large portable kit with a big capacity for rapid response. Spill Kit includes UV resistant label, laminated re-order form & operating instructions. Spill Kit is supplied in a high visible light brown water resistant carry bag. Spill type: Absorbs oil, fuel, diesel, petrol & other hydrocarbons. Repels Water. Application: Standard duty oil/fuel only pads for cleaning up everyday spills or wiping down equipment - effective on land and water. Absorbent capacity: 35 litres per pack of 50. Ideal for maintenance & minesite workshops, vehicle repair shops, fuel & oil handling facilities, service stations and transport depots. Great for bilge & floor mop up in ships, boats, naval and service vessels, oil rigs and floating platforms. 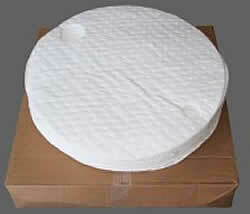 Standard duty 5mm compressed meltblown polypropylene pads with high oil/fuel absorbency for spills, leaks and drips. Lower transport and disposal costs due to high absorbency to weight ratio. Tough, durable, non allergenic, non-hazardous and dust free absorbent. Excellent water repellent characteristics (hydrophobic) - use in the rain or float on water to absorb oil & fuel only. Rapidly absorbs spills for improved safety and productivity in the workplace. Can be squeezed and re-used. Simple and easy to use without the need for specialised PPE. 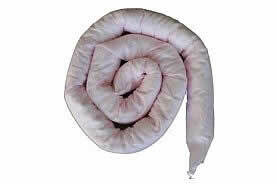 50m x 1.0m Spill type: Absorbs oil, fuel, diesel, petrol & other hydrocarbons. Repels Water. Application: Heavy duty oil/fuel only rolls for cleaning up everyday spills or wiping down equipment. 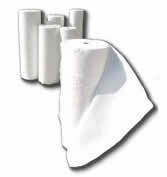 Absorbent capacity: Up to 344 litres per roll. Heavy duty 10mm compressed meltblown polypropylene with exceptional oil/fuel absorbency for spills, leaks and drips. Cut to required size easily with scissors or utility knife. Absorbent capacity will vary depending on liquid viscosity, specific gravity & temperature. Absorbents retain the characteristics of the absorbed liquid. Appropriate PPE should be worn and disposal of used absorbents should be via incineration or to approved landfill in accordance with local regulations. For easy dispensing, order our wall mounted Roll Holder part # RH. Spill type: Absorbs most acids, bases, coolants, paints, solvents, oils and hazardous chemicals. Application: Use wherever chemicals are stored handled and spilt. Absorbent capacity: Up to 12 litres per boom. Ideal for chemical processing plants, paint & panel shops, chemical storage & handling facilities, transport warehouses, food & beverage processing plants, printing and automotive workshops. Prevent spills from escaping by forming an absorbent barrier around drums, tanks, containers, plant and machinery. Protect stormwater drains from chemical contamination. Absorbs and cleans up most acids, bases, paints, solvents, hydrocarbons inks, dyes and aggressive water based liquids on contact. Made from 100% Unisorb™ meltblown polypropylene able to absorb up to 20 times its own weight in liquid. Unisorb™ is an inert, surface modified polypropylene which does not degrade or chemically react with the absorbed liquid. High absorbency to weight ratio = lower transport & disposal costs. Non allergenic, non hazardous with no dust. 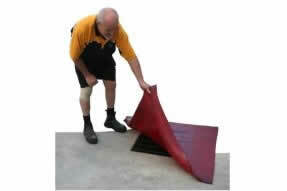 Fast wicking action allows quick clean up, reduces potential slip hazards and improves safety in the workplace. Simple to use without the need for specialized PPE. Colour coded pink for easy identification. Absorbent capacity will vary depending on liquid viscosity, specific gravity and temperature. Unisorb™ polypropylene is compatible with, and absorbs most acids and bases. The suitability with a specific chemical should be confirmed by referencing the MSDS, a compatibility chart or sample testing. We can provide samples as required. Absorbents retain the characteristics of the absorbed liquid. Appropriate PPE should be worn and disposal of used absorbents should be in accordance with local regulations. Absorbent capacity: Up to 18 litres per boom. 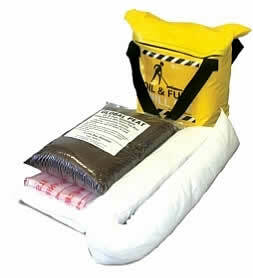 Application: Oil & fuel only pillow used to absorb large pooled spills. Highly flexible - can be stuffed into drains, placed under hoses, next to drums and below oil dispensing reels/nozzles. Absorbent capacity: Up to 13 litres per pillow. Great for mine site & maintenance workshops, fuel handling facilities, oil storage depots, lubricant dispensing facilities, vehicle maintenance & repair shops. Ideal for blocking and protecting stormwater drains. High capacity absorbency makes pillows ideal for quick response mop up for larger pooled oil/fuel spills. Made from Envirosorb™ meltblown polypropylene with exceptional oil/fuel absorbency for spills, leaks and drips. Envirosorb™ is able to recover 20 times its own weight in oil. 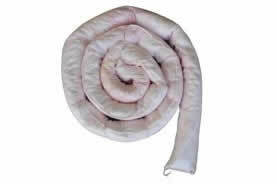 Tough, durable, non allergenic, non hazardous and dust free absorbent. Excellent water repellent characteristics (hydrophobic) - use in the rain or float on water to absorb oil and fuel only. Fast absorption for improved safety & productivity in the workplace. Absorbent capacity: Up to 3.2 litres per pillow. High capacity absorbency makes pillows ideal for quick response mop up for larger polled oil/fuel spills. Say goodbye to messy, unsightly drum tops, & dispense cleanly using a Drum Top Mat! Designed to sit on top of the drum, each cover is pre-cut to fit a standard 60L & 205L drums, with allowance for fill & breather-holes. These Drum Top Mats will help keep your work environment cleaner and your workplace safer. 10 kg Spill type: Absorbs oils, fuels, coolants, degreaser, mild acids & caustics, paints, solvents and most liquids. Application: Use on hard or porous surfaces wherever oils, fuels, chemicals & liquids are stored, handled and spilt. 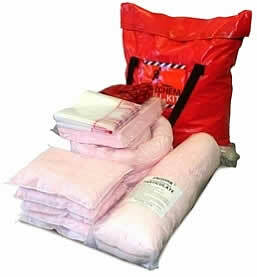 Absorbent capacity: Up to 20 litres per bag. Ideal for road side spills, service stations, maintenance workshops, parking areas, re-fueling areas, paint & panel shops and automotive workshops. Mineral based universal absorbent for removing all liquid spills from hard surfaces such as concrete and bitumen. Ideal for when the surfaces are weathered and porous. Use in windy conditions when a heavy, granular absorbent is required. Able to absorb up to 2 times its own weight in liquid. Unlike other 'kitty litter' type clay absorbents, the Zeolite granules have a large internal surface area that absorbs liquid into it by 'capillary' action. Zeolite reduces vapours and odours on contact. Small granules reduce potential slip hazards and improves safety in the workplace. 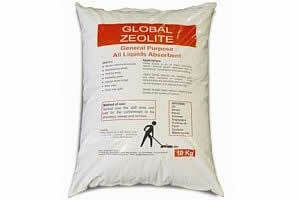 Zeolite is compatible with, and absorbs mild acids and bases. The suitability with a specific chemical should be confirmed by referencing the MSDS, a compatibility chart or sample testing. We can provide samples as required. Application: Chemical resistant polyurethane covers create a tight seal over drains. Flexible material moulds to uneven surfaces. Drain Cover is a flexible urethane with a tacky base that bonds to smooth surfaces. Helps you comply with spill control measures, avoiding costly fines. Choose a size that overlaps your drain grate at least 10cm. Barriers are easily cleaned and reused. Use soap and water. Ensure the barrier is cleaned and store properly after use. Do not leave in direct heat for periods of time. Supplied in a high visible yellow canvacon carry bag with handles. Life expectancy is 5 years. Supplied in a high visibilty yellow canvacon carry bag with handles.